(NationalSecurity.news) The chairman of the House Armed Service Committee’s subcommittee on Sea Power called on the Obama administration last week to send American aircraft carriers to ports of call in Taiwan after China refused to allow the USS John C. Stennis to make a port call to Hong Kong. Rep. J. Randy Forbes, R-Va., said his major concern was that China’s refusal to grant the port call disrupted planned meetings between sailors and officers and their families who had traveled to the Asian economic center there to meet them. “It’s a huge disruption to the men and women on those ships,” Forbes told the Washington Times’ Inside the Ring column. Some sailors’ families spent a great deal of money to travel to Hong Kong to meet the ship. China appeared to abruptly cancel the port call in a move signaling its angst with the Pentagon regarding disagreements over China’s outsized island reclamation in the South China Sea, said Forbes. So, as a result of Beijing’s increasing control over the Asian economic powerhouse, the lawmaker said the Pentagon ought to reconsider re-routing the carrier to Taiwan or other more stable ports in the region. A carrier visit to Taiwan, which China considers a renegade province that is really part of the mainland, “might make it less attractive for China to continue to treat the United States Navy the way they did in this particular situation,” Forbes – who also is co-chair of the Congressional China Caucus – said. “The time has come to consider these alternate locations going forward,” Forbes said. The denied port call will likely only raise tensions further between the U.S. and China, already high after China has began a few years ago reclaiming remote islets in the South China Sea and, more recently, militarizing them. The Stennis passed through the vital waterway in April. Defense Secretary Ashton Carter visited the warship, a symbol of U.S. power projection in the region, the Times reported. The U.S. switched diplomatic recognition from Taiwan to the People’s Republic of China during the Carter administration, in 1979. Since then, military relations with the island nation have been limited. Though Congress passed, and Carter signed, the 1979 Taiwan Relations Act, which requires the U.S. military to defend the island if it comes under assault by China, visits by American military personnel and warships is still limited so as not to upset Beijing. 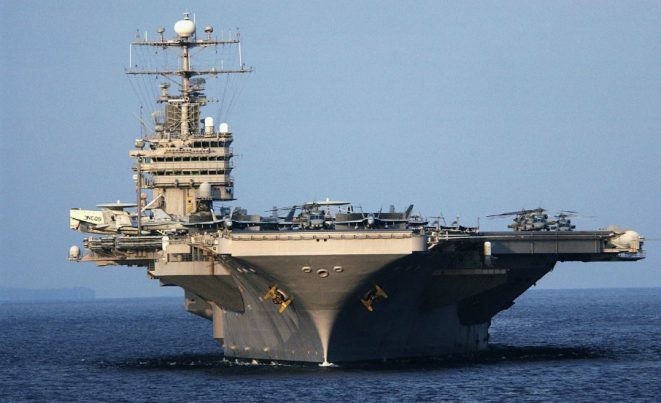 In 2007, the carrier USS Kitty Hawk was similarly blocked from visiting Hong Kong. In response, the carrier sailed through the Taiwan Strait in a show of U.S. support for the island, the Times reported. NationalSecurity.news is part of the USA Features Media network. Click here to see all current headlines.